A) The Chinese stock markets, specifically the Shanghai Composite, is a key indicator of economic activity in China, and led strongly by the industrial giants and housing from its previously high weighting on construction, housing, and manufacturing. B) This results in an extreme correlation between the Shanghai Composite / China A50 indices and the global commodity prices excluding oil (other drivers) and precious metals (as much currency as commodity). Take some time to acquaint yourselves with the common industrial metals if need be, especially nickel, aluminium and copper. C) Comments out of the CCP and Xi Jinping’s history would indicate that he is the man to push for new urbanization and free-market reforms. Largely, this would then see large appreciations for construction (of both housing and infrastructure) in terms of the outlook. D) Greater China in general is having stock market reflation and a lot of momentum with it at the moment, and it looks like liquidity will keep being ample worldwide. Momentum, simply, is with the Chinese indices, and it looks like the ever greater liquidity should at one point or another also be reflected in commodities if the world indeed starts seeing any sort of real growth in the coming few years. Given this, what is the technical playground looking like? Well, for starters, look into the analysis of the China A50 I did a while back to get up to speed – it contains a lot of the important background information and more nitty-gritty fib-level outlooks, among other things and it is generally something that will be needed to enjoy the following analysis at its best. 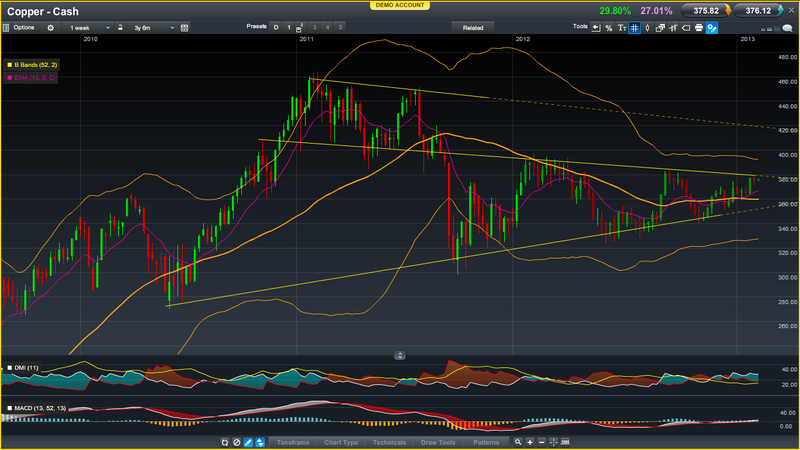 China A50 breakout on the weeklies, and the next battle lines are at 9500! We have a Bollinger band blowout on the weeklies. This, given the way the market is rallying, is good and highly bullish. Looking at the retracement it did a month ago, we can see that it comes in below the 61.8% fib, indicating a great hook. This is repeated currently, right below the 50% (false) fib, and replicates the “hooky” way in which the market rallied to form the move that generated the fib to begin with. We now have serial hooks at similar levels, indicating similar rebalancing efforts by traders as the market moves upwards. We have a very “wicky” last week candle with overweight on the bottom wick, which is a good indication of a sustained movement. MACD and ADX/DMI giving the all-clear. Nothing to be worried about here for a few weeks! Annual EMA/SMA positive divergence maintained, after having flirted with the possibility of crossing over. This is really good, as the divergence started early in 2Q2012, but since persisted given the slow, bleed-out fall and consecutive new lows. The rejection near the bottom should give bulls the ammunition they need to push the market higher for considerable time. This is all supported by a rocketeer wannabe of a quarterly EMA! The move that started this wedge began more than 2½ years ago and the price has been contained within those lines for almost 1½ years. There is also a great “target span” $40 above current price, and both ADX/DMI and MACD are giving either positive signals or indicating that they are highly sensitive to any moves. The tightness of the Bollinger bands also makes this contract ripe for any more aggressive move to get legs as soon as hedging contracts are taken out and hedges need to be rolled. Given the MA clustering slightly below and then the bottom trend line, there is a lot of support for the price coming into these levels, especially given that a shorter-term, more aggressive trend line /channel has been supporting price for the last 3-4 months. On the resistance side, there is a large number of less significant ones clustered around the $380-$400 levels that the top line has been bouncing around. however, I do expect the resistance-clearing momentum from clearing any one of them to generate enough inertia to overcome the next resistance level, and so on. If anyone is wondering where the winds are blowing towards, check out what nickel (major component of stainless steel in terms of price) has been doing as of late. The convexity is stacked in favour of this trade, and it could really get legs if industrial activity in Japan gets some speed to it! The markets are extremely crazy today. Currencies seem nearly restless today, jumping on any volatility on the horizon and riding the momentum whichever way the fiddle thoughts of the collective conscious pull them. The euro did a 70-minute 80-85 pip move, and then retraced it perfectly 61.8%, after having turned around following a break of the 38.2%, and the EUR-periphery currencies are playing along to the same tunes with one hour saying constant minute-to-minute out-performance, the next being reversed and letting the euro take the value spot. After the push towards the 61.8%, there has been a pretty strong attempt at rallying back (probably to keep the EUR/JPY somewhat fixed after the Fenix-like rise of the yen, more later) with straight, minute-to-minute 2c moves. They have not done anything but talk. Mostly about reinvigorating their economy. Let me conclude that Japanese politicians are forever forbidden from talking about the yen? I hope not. This would then contrast how exactly with Switzerland? Or, to be more blunt, the US – given the levels of balance sheet expansion that the Federal Reserve is engaged with in (for all intents and purposes) perpetuity? As a related question, are they required now to not stimulate their economy since their trading partners/competitors can only accept “up” in terms of the yen value? This was explicitly stated in the communique as something that they should be commended for doing! Does this mark the end of yen-funded risk? What politicians would want an ever so easy mechanism for juicing their stock markets as a 10% monthly decaying loan for all their traders? This was most likely mostly an overreaction by the market, and might present a dip-buying opportunity come next week when markets open properly across Asia and yen investors can pile out, and have had some time to get a yen-rally following G20 musings. Stocks seem stuck in syrup. There is simply no other way to say it when the stock indices (except the Nikkei 225 futures) barely budge on any of the currency moves. Could this be because of the expected State of the Union (which everyone knows is laughable, interpret as you see fit) address? I very much doubt it, and I think it looks much more like a volatility suppression mechanism, and simply waaay too many options going on issue to keep the week clean. It could also be the disruption of futures markets given the Chinese holiday being in effect tomorrow as well (but returning on Thursday in Hong Kong at least). it is no news to the majority of the world that the euro has been doing pretty well against both the US dollar and particularly the yen as of late. It will certainly not come as any surprise to S3 readers! I thought of doing a little follow-up on that euro-chart and see where we could be heading next. I apologize in advance for the shoddy screen capping. As usual, chart courtesy of CMC Markets. EURUSD update.Did someone say 600 pips? It has pretty brilliantly followed my recommendation from early December, and then used the ascending trend line to back it strongly. Now we are coming up to the more significant test of the upper descending trend line closing the triangle. What is the technical situation saying here? First of all, we have a Bollinger blowout, meaning that the distant Bollinger band (annual window on this chart, and the distant band is lower) is expanding vs. the moving average. We can conclude from this that the move higher is very much supported, and breaking range. On top of this, we also have the MACD flaring positively – coming out of a histogram trough, a bullish zero-line cross and about to bring trend with it. There’s also a moving average minimum being made (supporting the trend) and this will accelerate as the annual price differential grows longer (the MA replacing an old low value with a new high one) which will provide increasing market support at these levels until the middle of the year and will further grow for every increase above 5 cent differential between this year’s price and that of the same period last year. There is more juice to this until the $1.40 level, but might get a little bit thin on the air around there. Still, don’t be afraid based on a single week correction! Consider decreasing exposure, or maybe going short, should the quarter (13-week) EMA fail to hold. Overall, the dragons soared on the wings of both diminishing risks and political intervention to ensure that ever higher skies were reached, except for in China, where the dragons awoke late to jolt the Shanghai Composite into a strong dragon year close. On the back of all this, what can we expect for the Year of the Snake? The snake is predominantly an intellectual creature, weighting the time to strike yet adaptive to the environment being restive in the cold and hustling with the return of the heat. Snakes love the heat and thrive in the hot months switching effortlessly between the lazy enjoyment of soaking up the sun and of stalking prey. Colder months instead prove hard times for snakes, as their cold blooded nature instead drains them of the energy needed to either enjoy inactivity or being successful when active. They are generally extremely focused creatures, pursuing their goals with a determination that borders on single-mindedness, while being generally lazy when there are few to no targets for it to pursue. Highly intellectual, wise, and solitary, they prize material goods and warm slowly to new people but willing to coil around them like possessions when they have finally done so. Furthermore, money is rarely on the snake’s mind – they simply have enough to not need to worry and it seems to materialize as needed. On the fundamental area, could the materialism be a spark of greater growth of the Chinese consumer markets? Furthermore, I doubt that market gains will be easily reversed although there could be a (very marginally) stronger consolidation pressure from any rallies. Again, the warming of the spring months just so happens to coincide with the political shift of the Chinese Communist Party, so watch out for a very interesting late spring! Water represents wealth and attainment, so as China warms up to the new summer and the water finally starts to flow, expect waves of wealth to reach the Chinese consumer. Similarly, there is likely to be continued pressure on the yen and the likely inflow of cash to the Greater China space leading up to a very likely consolidation of LDP power in the summer election in Japan could keep pouring more hot money into this geographical investment area. Any let-up of the hissing in the messy snakes’ nest that is US politics replaced by any actual policy action and more warm blooded digestion of the fact that there needs to be bipartisan compromise could also grant snake year investors quite high gains over the summer. Overall, I expect decisive moves over the summer, which could well subside strongly as the winter returns and more uncertainty in both the US, Europe, Japan and China enters the field. The US will have to contend with its political mess at one point or another, and it feels increasingly like the fall will be “it”. Similarly, I highly doubt that the European debt crisis has stabilized enough to get us through a full year without strong headlines coming out. Japan will most likely be in the “sour spot” where Abe’s election does not yet lead to new policies, the BoJ won’t do anything for a few months, and the “buy the rumour, sell the news” mechanic can run full force. One might also wonder if the shine will come off the new Chinese leaders and market gains or inflation coming in and forcing a slight cooling down of the economy. Again, this is as far away from fundamental as I would ever like to stray. Personally though, I don’t believe in predictions of the astral, but I find it all to be very interesting and I like them very much, so here is my more numerical discussion. It is derived from such financially sound procedures as rolling comparison (between dice), the residual-in-coffee method, and discounted present value of dream dust, so please keep your eyes peeled and then promptly laugh it off. 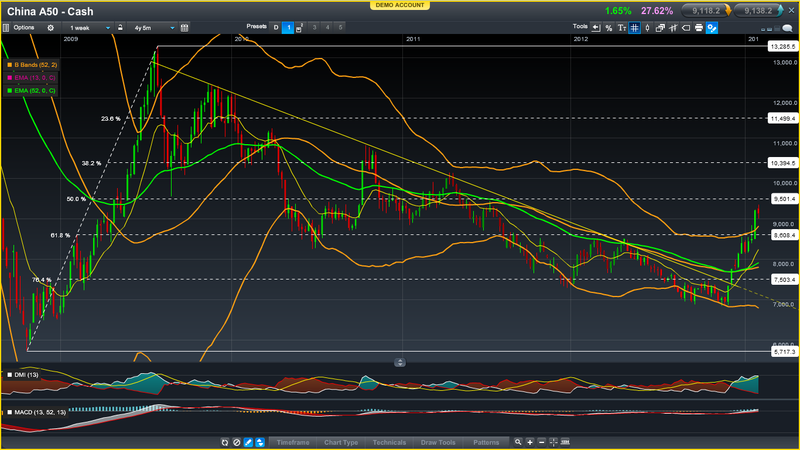 Nikkei 225: 1H Water Snake – 14 444. Simply because of the numerology (association of 4 with “death” from the similarity of “shi” and “shine” in Japanese and the much closer link in Chinese.) 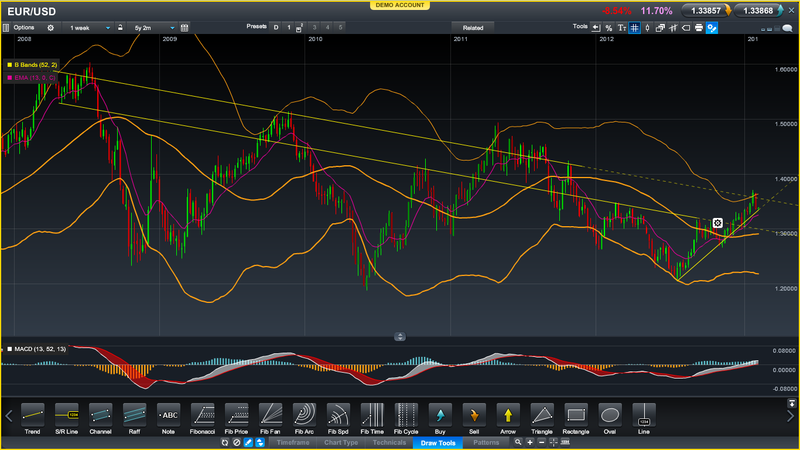 After this, I expect a retracement back to the 13 000 level as a line in the sand. From here I do expect wild, yen- and earnings-driven swings somewhere between 13 000 and 15 000, so volatility will be up here in my view. Additional forceful monetary easing could see it push 17 000, but then we’re in “nana-land” fundamentally! USD/JPY: 112 by June, simply since it reads “hyakku juni”. It would be a somewhat similar pace to what we have kept so far, and any retracements towards 104 could be highly likely. I would not be surprised to see it finish the year at 137 (50% up from today) if enough corporate and household cash leaves the nation. Hang Seng Index: Initially, within the first new lunar month, I would expect the “five elements” to come together and crystallize into a 25 000 reading. This is similar to what I expect the Shanghai Composite to do based on this numerology alone. The resistance would then come in at 25 528 (based on 528 wordplay implying tough luck) possibly creating a quick fall towards 23 333 (implying market rebirth, after a very rough ride through the “death barrier” around 24 444 and 24 000). If, after this, a push past 25 954 (coupled harmonic long-lived elements) and 26 000 (doubled flow of thousands) occurring in the same day, it seems the stars will be aligned for a good push through the 27 000 (rising thousands) to consolidate at 28 888 level (great fortunes) just as the snake finds itself out of sunlight and needing to recover in its cave. It could be very likely that the effort of just staying awake at all will take such a great toll on the snakes, that a final hiss will drag the spirit of the snake down to 24 000 before handing over to the next animal. Still, the central forecast is a constricting grip and consecutive squeeze out of any volatility that finds its way into the market, to settle a hair above 26 000 before the snake recovers for its next return in 2025. Any push above 30 000 would likely fuel further gains far and fast on the back of the “birthing of the myriads” but here the 34 000 level could provide significant verbal guidance confusion. On the other hand, if the 20 000 level is lost, there is a pretty annoying chance that the snake dives below 16 000 (however briefly) before finding its proper flow and elemental balance. This is of course because of the added benefit of the “double” or “coupled”implied by the leading 2. China Indices: Leading Hong Kong in terms of time, and expect the constricting motions to start earlier given the split-tongue personalities of the Chinese politicians. for the Shanghai composite, for any repeating lucky numbers or zeroes, simply remove the last digit. For 25 954, the equivalent is 2 554. Sunday Snack, 03/02/2013: Balance sheet expansion? Question: How much US treasury holdings does Japan have? Question: How has this portfolio performed, in yen terms, since the late September low? Question: Assuming a 19% increase in the yen value of these holdings, how much… is that really? Let’s put this number in perspective: Japanese 2012 GDP was at $5.8672 trillion. Let’s use the $225b number since it’s closer to the annual average. That’s 3.84% of GDP. A little sensitivity analysis and common sense then shows that the balance sheet of whoever in Japan holds this debt increases by 1.15 trillion yen for every one yen increase in the value of the US dollar. Question: Who holds this debt, and how do I buy into them?